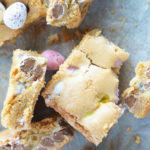 These Easter mini egg blondies are something I decided to bake because we always end up with an excessive amount of chocolate after the Easter weekend. 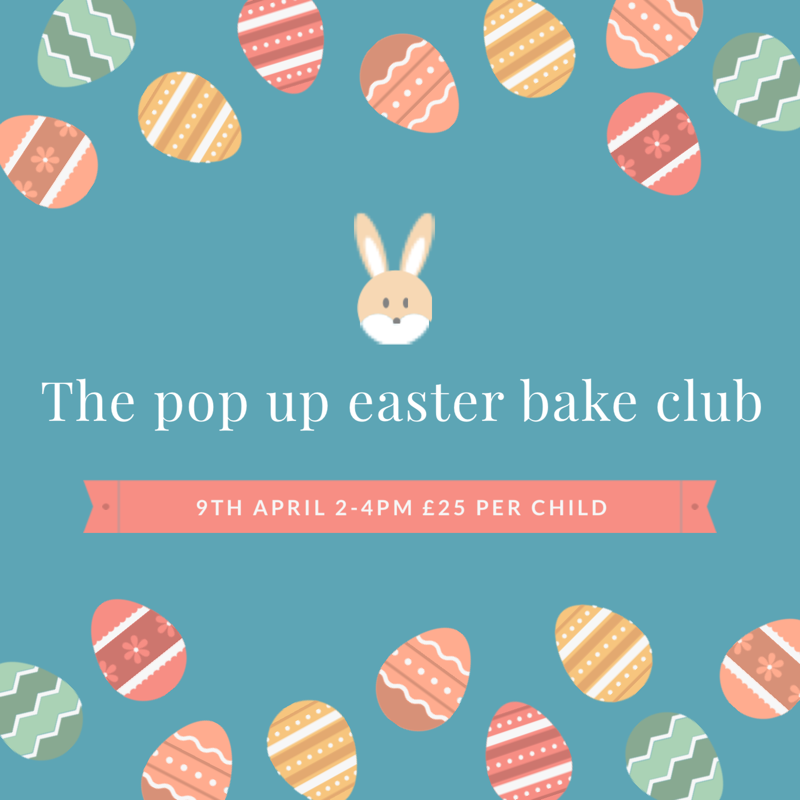 Mini eggs, creme eggs, Kinder eggs and all the various miniature chocolate foil wrapped treats get collected up and put into a tub ready for baking. And that’s without the main Easter eggs, which I have gradually been buying smaller and smaller versions of each year while increasing the mini eggs – which I prefer. 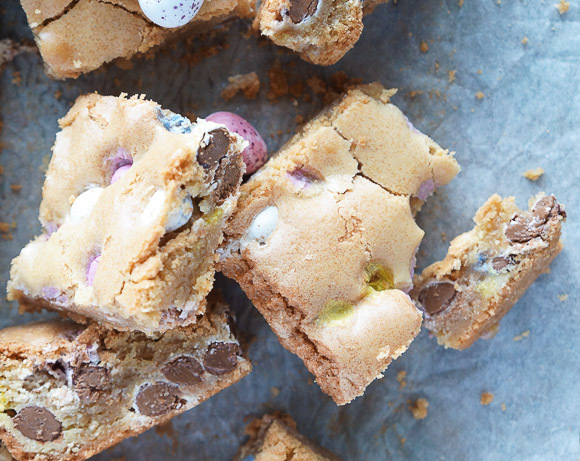 Blondies also happen to pair really well with milk chocolate and white chocolate over dark chocolate which, again, makes them a perfect bake in which to add your leftover broken up Easter eggs. I also much prefer blondies to brownies and that’s partly down to the discovery of browned butter. You don’t have to brown your butter to make these blondies but it does turn them into a nutty, butterscotchy, caramel delight with a crisp crust and fudgy chewy centre. My advice when browning butter would be to watch it constantly and don’t be surprised by how long it takes to get to the foaming stage. It will bubble away for a few minutes before you see signs of the foam. 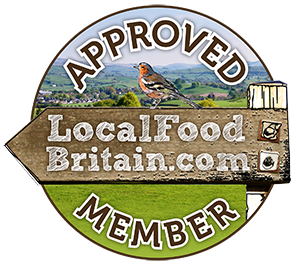 At the point when it does start to foam, watch it carefully and remove from the heat as soon as it starts to smell nutty and the bottom of the pan shows signs of brown colouration. I also find using a heavy based pan (Le Creuset style) a good idea as lightweight pans can turn the butter from light brown to dark and burn very quickly – wasting a whole pack of butter if you do! 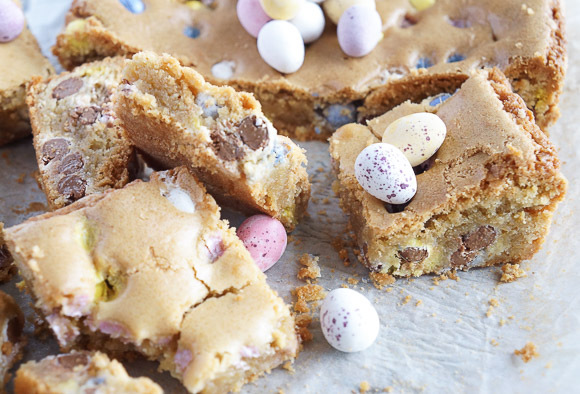 If you haven’t tried blondies before then my Easter mini egg blondies are definitely the place to start. Let me know if you also find them far more delicious than brownies. 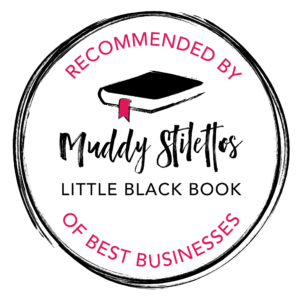 If you’re looking for the ultimate blondie but want to buy one, before you try to make them, then you must seek out Violet Cakes butterscotch blondies. 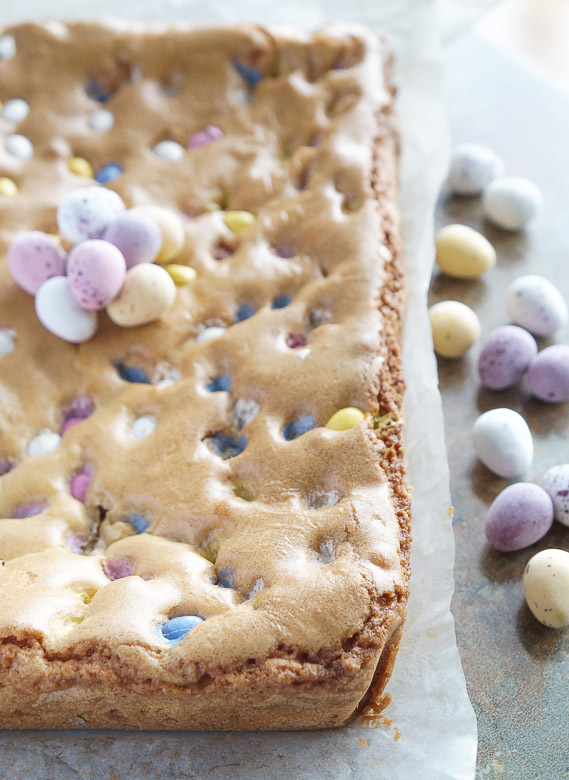 It’s also the recipe I based my mini egg version on. There are incomparable. 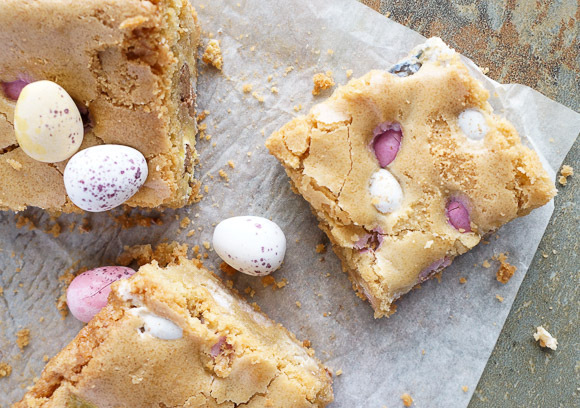 These delicious Easter mini egg blondies are a great way to use up any leftover Easter chocolate. 250 g browned butter melt the butter in a heavy based pan until it starts to foam and smell nutty, which will take a few minutes. It will turn a golden brown. Remove from heat immediately and leave to cool. The blondies will keep well for up to 3 days in a sealed container or up to 5 days in the fridge. Oh you must try them Camilla! I blinking love mini eggs. They are my favourite easter chocolate! I’ve actually never made blondies before, but I love browned butter so am sure I’d enjoy them. Yum! Yes you would Loe them Ceri. Surprising how many more people make brownies over blondies. I’m now the opposite! I will have to hide this post from the kids or they might want me to make these like RIGHT NOW. I bet they would Bintu! Can you believe that I have never had a blonde before?? I need to try one and this looks like a great place to start. Seems your not on your own Dannii, they are so much better than brownies! I’m making these for Theos birthday, which falls on Easter Day this year. As you know we are big fans of the Violets Blondies and this looks like a great take on that recipe.